It's no longer good enough to build a company to last; today it's about building a company to ignite change. The Power of Positive Destruction reveals how to start a new business, disrupt an industry, and adapt to changing environments by leveraging technology and a new mindset. 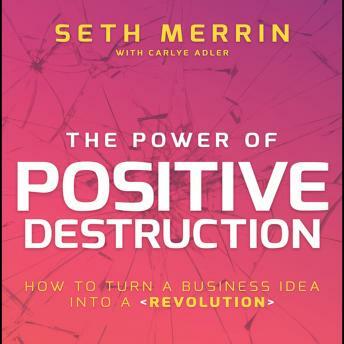 Serial entrepreneur Seth Merrin has built businesses by seeing issues with the status quo and introducing positive changes that have disrupted-and revolutionized-industries. In this audiobook, he breaks down his process step-by-step to show you what you need to know to successfully start a company and transform an industry. Merrin's incredible story, coupled with real, actionable advice, will resonate with anyone who wants to be a catalyst of change. With this audiobook, listeners will learn to see the inefficiencies, ineptitudes, and everyday problems that others dismiss as the cost of doing business and create "unfair competitive advantages" to stack the deck-and win. You'll see how problems in current business models are really opportunities of which to take advantage and learn what you need to know and do to seize those opportunities -no matter where you work. Seth Merrin saw Wall Street as it was, then built a company to turn it into what it could be-safer and more efficient for investors. This book shows you how he did it, and how you can too, with the power of positive destruction. Technology and innovation can disrupt or transform any industry. It's happening faster and more broadly now than ever, creating myriad opportunities for everyone. But winning in this new world is not easy. The incumbents will fight mightily against it and even those who would benefit from change may first express fear. This audiobook reveals the techniques from identifying the opportunities to designing and executing the strategy you'll need to succeed. With The Power of Positive Destruction you can to tap into your inner change agent and transform your company, your industry, and the world.